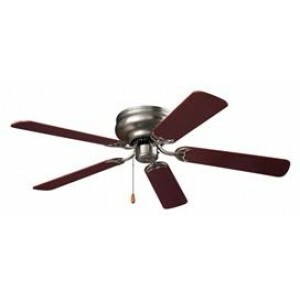 Nutone CFH52BS Hugger Series Ceiling Fan is an indoor use only, 52 inch ceiling fan that features a pull chain operation, and brushed steel body with dark cherry/light oak dual finish blades. Ideal for low ceiling applications, Nutone Hugger series fans offer the same classic styling as their taller cousins, but require less space. All Hugger housings are designed to mount flush with the ceiling and install directly onto an outlet box, positioning blades a mere 7 inches from the ceiling. For added convenience, wall controls are available and sold separately. Note: Not for use with Remote Control or Downrods.Timeless styling gives any room a more finished look. At low speed, the quiet, gently rotating blades create a peaceful atmosphere. Nutone ceiling fans are an elegant addition to any room, with two blade finishes to choose from, you can pick a style to suit your room decor; reversible, dual finish fan blades give you more options. Nutone fans not only enhance the look of your room, but are also a practical way to improve the comfort of your living environment. During the cold weather months, flip a switch to reverse rotation direction to force warm air down. Plus, NuTone's attention to detail and full line of accessories ensures that your fan is as effortless to install as it is to operate.Turn your indoor ceiling fan into a beautiful light fixture; hugger series Nutone ceiling fans accept all Nutone indoor Light Kits. Nutone ceiling fans contribute to the charm and value of your home or office.Please Note: Dual Finish Blades on Nutone Ceiling Fans are One (1) Set of Blades that are reversible, giving you the option of displaying either the Dark Cherry Finish Side or Light Oak Finish Side.